Alice Springs author and artist Rod Moss has won the Chief Minister’s Book of the Year Award for his memoir, One Thousand Cuts, while the graphic novel, The Long Weekend in Alice Springs, by Craig San Roque and Joshua Santospirito won the Non-Fiction Book Award. 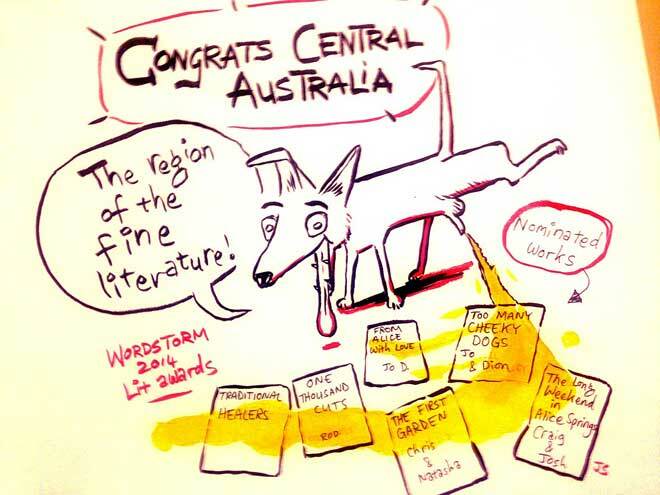 Central Australian literature was heavily represented in this year’s literary awards. Runners-up for Book of the Year were Christopher Raja and Natasha Raja for The First Garden, the published text of their play about Olive Pink, and Jo Dutton for her novel, From Alice With Love. The NPY Women’s Council was a finalist in the Non-Fiction Book Award for their beautifully produced book, Traditional Healers of Central Australia: Ngankari. A writer strongly associated with The Centre, Kerrie A. Nelson, won the NT Writers Centre Poetry Award for ‘Memento mori’, while Alice Springs poet Sue Fielding was a runner-up for ‘Tread softly’. Ms Nelson has previously lived in Tennant Creek and Alice Springs, and after a spell in Canberra, recently returned to work in the Aboriginal community of Willowra. Too Many Cheeky Dogs by Johanna Bell and Dion Beazley was a finalist in the Children’s Literature / Young Adult Fiction Award. Note: Follow the links to Alice Springs News Online reviews and articles about these publications. A list of all winners and finalists is on the NT Library website.